So I'm rebuilding my PC again, and I realized that I'm going to need a list of my Windows-based software that is essential to getting stuff done. 1) Vista - hey, you gotta have an OS, right? Automatically fill your address books or send mass mails with e-mail addresses extracted from all your e-mails. It sounds like something a good person wouldn't do, doesn't it? Lose their addressbook, I mean. But if you do, and you're a Thunderbird user, this little gem can save your life, not to mention your hair! I kinda wish I'd found this link before I went all nuts on down this road. I think I could have learned a lot more about email and application configurability if I'd played more before leaping. When you push the Export Times button, you should get a window like this. You’ll note that the dates I picked begin on Monday, 5 October 2009, and end on Friday, 9 October 2009. A note on this: It remembers that last dates you used, so you have to re-set the dates to the current week every Friday. 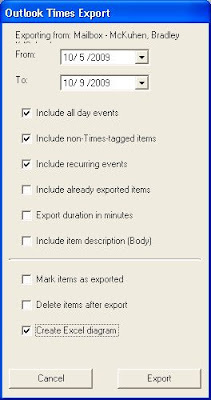 Also, make sure you pick “Recurring Events” and “non-times-tagged items”! 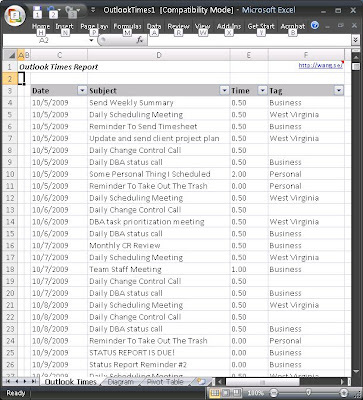 Once you hit export, you should get an Excel window like this. Check out the diagram tab, if you selected “Create Excel Diagram” in the Export Popup! 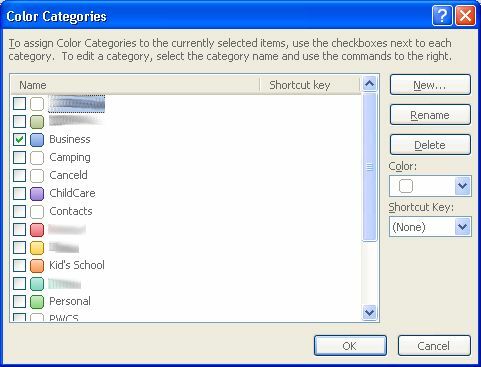 Next, I defined some custom categories in Outlook. Because I sync Outlook with my Treo smartphone, this part was easy. Along with defining the categories, I assigned each custom category a color. Now my category list looks like the following. All I had to was shut down Outlook, install the product, and then restart Outlook. I use my calendar heavily to track both my personal and my work life. Since I use a Treo, I have no problem recording events realtime as they happen in my calendar, and assigning the tasks a category. However, it seems to take a lot of time to build my status report at the end of the week each Friday. What I wanted was a tool that would convert my Outlook appointment info into a useable format, so I could quickly remove any unneccessary tasks, like a meeting I didn’t attend, and then just send it on. Here’s a sample of one week. 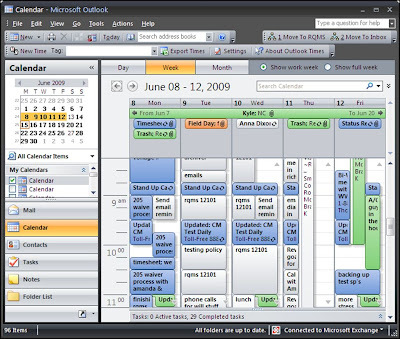 I’m sure many people have calendars that are much more crowded than this! So, I'm just happily emailing along the other day, and I need to arrange a conference call. 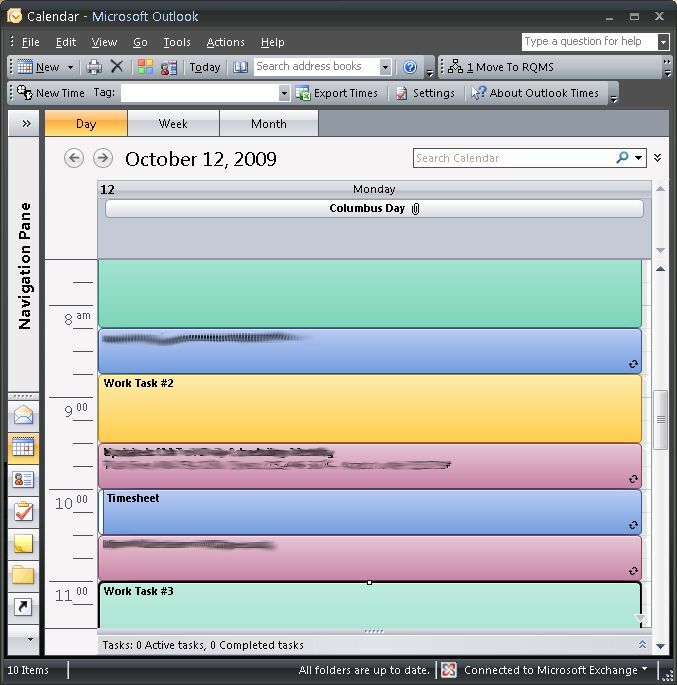 Now, usually, this is a simple matter of popping open Outlooks calendar, entering the name of the person I want to meet with, and clicking the Scheduling Assistant button up at the top. In this case, however, no one I tried to enter would come back with free/busy information. I live in my calendar, and use it for time and billing tracking, so having inaccurrate information in there drives me to distraction. One quick registry edit, and I was back in business! My name is Brad McKuhen. I am currently a Microsoft SQL Server Database Adminsitrator, DBA, & SQL Developer. In past lives I have worked with SQL, SQL Server 7.0/2000/2005, T-SQL, Oracle's PL/SQL, Crystal Reports 8, 8.5, 9, VB 6, VBA, VBScript, & JScript.